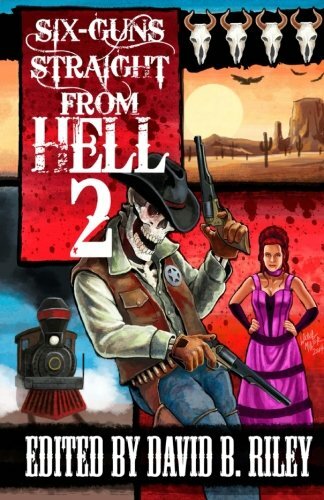 My short story “A Dream of a Country Cottage” appears in Six Guns Straight From Hell 2: Horror and Dark Fantasy From the Weird Weird West from Science Fiction Trails. This two-fisted tale involves Jonathon Heller and his quest to come to terms with his father’s ghost. Saddle up for a wild ride through the Old West You’ll find a wide variety of western horror and dark fantasy in these pages. One story skirts modern times as it tries to deal with ghosts of the Civil War. Another has an African tie-in to an Arizona adventure. There’s a haunted mine, complete with a very unusual ghost hunter. There are plenty of vampires. Need gunfights? We’ve got ’em, including Joel Jenkins’ popular Native American gunfighter, Lone Crow. Also featuring stories from Kenneth W. Cain, J. A. Campbell, Vivian Caethe, Sam Knight, Kit Volker, Jason Andrew, Dakota Brown and David Boop.